Boy, that stunt/elaborate suicide attempt in the latest Tom Cruise blockbuster looks like a time and a half. I didn’t name which one because I want this article to work until at least 2030, maybe 2040. These days, Tom Cruise hasn’t just become synonymous with actors doing their own stunts, he’s made it a core tenet of his being, like shadow religions and running. He’s by no stretch the first actor to make a habit of scaring insurance companies in the name of realism — but then again, is that really what it’s for? “I don’t want to risk 80 people’s jobs just so I can say I have big nuts.” That quote comes courtesy of Danny Trejo, certified tough-guy actor, vegan taco entrepreneur, and prison boxing champion. By most objective standards, Danny Trejo doesn’t need to prove such a claim, and that’s probably why he can spot the posturing so easily. That seedy, self-mythologizing side of actors doing their own stunts belongs to a broader profile of paid pretender: The Actor Who’s Just Like His Character. You can probably imagine a few, mostly men, who strain to remind audiences that they’re equally, if not more impossibly capable, calm, and charismatic, as their most famous role, Commander Cool™. That’s what makes would-be wish-fulfillment fantasies like Three ¡Amigos, Galaxy Quest and Tropic Thunder go down without an aftertaste. What if those actors got a chance to be Just Like Their Characters? This accidental trilogy says it’d be a miracle if they even survived. ¡Three Amigos! (1986) is the earliest, silliest, and sweetest of the three. That dastardly ego, which Galaxy Quest (1999) dwells on and Tropic Thunder (2008) basks in, is dealt with in one line. 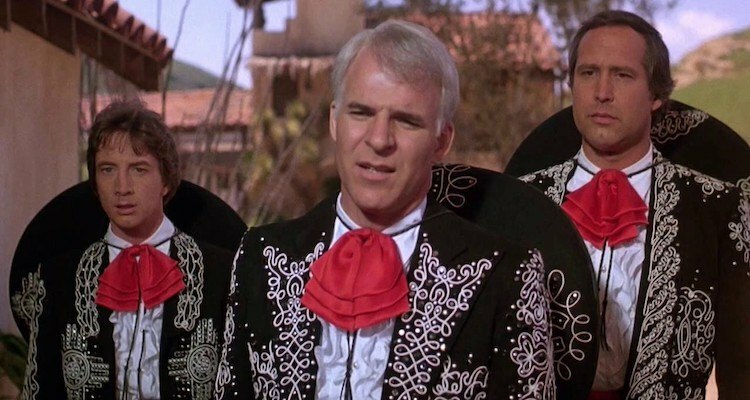 When the Amigos are forced to make a formulaic sequel, Steve Martin’s character sticks it to the head of the studio with a downright withering “That’ll be the day.” At first glance, ¡Three Amigos! seems too unashamedly daffy to function as a companion piece to its more satirically minded descendants, but it lays most of the groundwork. Desperate for money, the Amigos agree to what they misunderstand as a live show requested by moviegoers who take their big-screen heroics as fact instead of fiction. This is directly mirrored in Galaxy Quest, when Tim Allen’s Shatner-surrogate humors some obsessive fans’ request for a (paid) personal appearance, not realizing said fans are aliens looking for a real commander. In both cases, the actors’ misled performances cost their misled admirers dearly. The Amigos accidentally antagonize the villainous El Guapo into raiding a village and stealing the woman who called upon them in the first place. Allen takes brazen/hungover control of the “fan-made” bridge and sets the friendly Thermians on a course with extinction. In the end, it takes the very catchphrases and recycled plots that got them into trouble to get them out of it. ¡Three Amigos! 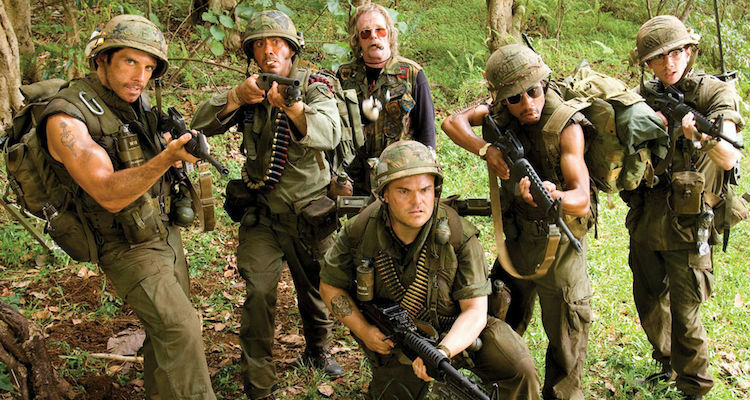 doesn’t bear as many direct similarities to Tropic Thunder, due as much to the targeted genre as a 22-year shift in sense of humor, but it provides the same parodic structure. The Three Amigos are silent film stars thrust into a Spaghetti Western. Their black-and-sequin costumes might as well be targets in a saloon where all drinks come pre-mixed with dirt. But when the Amigos decide to be the heroes they were recently fired from being, the movie gets silly with them. The Invisible Swordsman, sing-along horses, and Randy Newman-voiced bush only arrive once the Amigos take charge. By the slapstick Spartacus ending, they’ve successfully turned it back into a silent film, quoting their earlier hits verbatim. Tropic Thunder isn’t quite so innocent. The actors are working on an Oscar-bait biopic about a war hero at the beginning, fall into something between Apocalypse Now and Missing in Action, then end up making an Oscar-bait biopic about their own experiences. Martin Short’s Amigo somehow finds a fan in Nowhere, Mexico, which tickles him until he’s forced to perform or die. Ben Stiller’s Tom Cruise wannabe is kidnapped by the only heroin lord in the Golden Triangle who loves his early work. He only avoids beatings and death by performing his worst role for a surprisingly receptive audience of armed drug smugglers, while also still being beaten. In both cases, it’s the key to the respective characters’ growth as actors and humans, even if it isn’t a profound growth. That’s where Galaxy Quest shines brightest. While a Vietnamese drug ring is believable and America has already co-opted the Spaghetti Western as approved history, a story involving casual space travel and shape-shifting octopus people is a harder sell. Galaxy Quest grounds its reality, from characters to comedy, to compensate for the bigger pill to swallow. The band of actors aren’t on the set of a major motion picture and haven’t just been thrown off the studio lot — they’re reluctantly cutting ribbons for any electronics store with good checks. They’re washed-up TV stars and they know it — everyone but Allen’s Jason Nesmith, anyway. When he finds out everyone else knows it and knows that he obviously does not, he spirals. Galaxy Quest doesn’t mock its would-be heroes as much as the others, especially Tropic Thunder. Jason Nesmith’s ignorant bravado endangers an entire species, but his ignorance isn’t borne out of stupidity. The characters don’t grow from egotistical morons to well-meaning morons; they’re jaded burnouts with varying levels of cynicism who quite literally find out the universe is bigger than their problems. Granted, there’s plenty of How-Did-We-Used-To-Do-This? fumbling. Sam Rockwell’s constant, Bill Paxton-inspired panic over his inevitable demise because he played the extremely expendable Crewman #6 in the original series deserves a place in the Running Joke Hall of Fame. 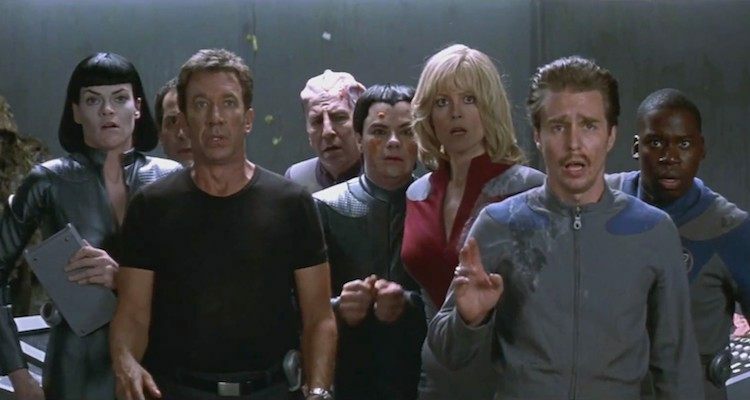 If its counterparts jump genres, Galaxy Quest jumps media, starting as a low-rent TV show and becoming a blockbuster sci-fi adventure, complete with a grander aspect ratio (in the theatrical release), before reviving as a slightly higher-rent TV show. It’s no fluke that Star Trek fans legitimately voted Galaxy Quest as a better Star Trek movie than half of the actual Star Trek movies. When it comes to the genre, Galaxy Quest loves science fiction like ¡Three Amigos! loves Westerns, but loves it enough to tear it apart. Tropic Thunder never seems so enamored with its subject matter. It’s telling that cowriter-director-star Ben Stiller got the idea from his actor friends going to boot camp for movies like Full Metal Jacket and coming back thinking they were real soldiers. Tropic Thunder doesn’t just wage war on actors who drink their own self-important Kool-Aid — it calls out award-friendly war movies as a whole for being the most frequent supplier of the pitchers and packets. It’s almost unfathomable to think that this movie took a lot of controversial heat upon release and it wasn’t because America’s recently resurrected sweetheart, Robert Downey Jr., not three months past Iron Man, played most of Tropic Thunder in blackface. Like Kurt Russell did with John Wayne in Big Trouble in Little China, Ben Stiller plays the whole thing as a slightly (and I mean slightly) subdued version of his Tom Cruise impression. And Tom Cruise himself is also in this movie, though three years away from Mission: Impossible — Ghost Protocol convincing him that audiences wanted nothing more than to see him almost die. The smartest character in Tropic Thunder is Jay Baruchel’s young hopeful who’s just happy to be there, which the movie calls out as his first mistake. He’s also, it turns out, the only character who attended a two-week boot camp; in Tropic Thunder’s callous cartoon of Hollywood, an actor need not actually endure an experience to have his ego blown out of joint by it. While the movie is a satirical shotgun blast that draws blood from the Nutty Professor franchise, TiVo, and dubiously talented musicians-turned-movie-stars, it earns investment — against all odds, we want to see Robert Downey Jr.’s uncomfortably committed method actor survive, blackface or no. But Tropic Thunder is hardly sentimental. Boiling down the three movies reveals them to be something like this: ¡Three Amigos! is silly, Galaxy Quest is sincere, and Tropic Thunder is scathing. Parallels run deeper than I could explore in this one article, but this unofficial trilogy, disparate in tone as its components may be, works as a consistently funny, occasionally heartwarming and often insulting exploration of our relationship with actors, the roles they play and the unseen canyons between the two. And if you’re looking for a more family-friendly option, there’s always A Bug’s Life. Jeremy Herbert does his own stunts in Cleveland.